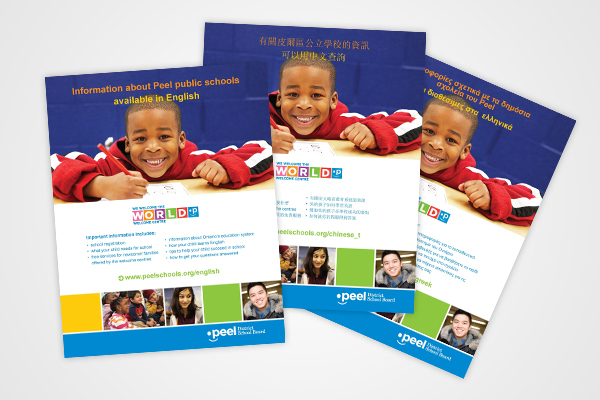 With 152,000+ students, 15,000+ staff, and 230+ schools, the Peel District School Board is amongst the largest in North America. The vast majority of people moving into the area are not native English speakers. Newcomers would arrive at the schools unprepared and confused about school procedures, uncertain about expectations, and often completely unable to communicate in English. This caused a great deal of unnecessary stress and hardship on the family. At the same time, studies show that engaging parents in their child’s education has an enormous impact on their success at school. This is impossible when parents cannot be part of even the most basic introduction to the system. To address these issues, the board opened a number of ‘We Welcome the World’ centres that provided assessment, registration, and other services in 42 different languages. We were brought in early during the development to advise on strategy. We recommended, delivered, and launched a 1000+ website in all 42 languages, complete with video featuring on-site staff. 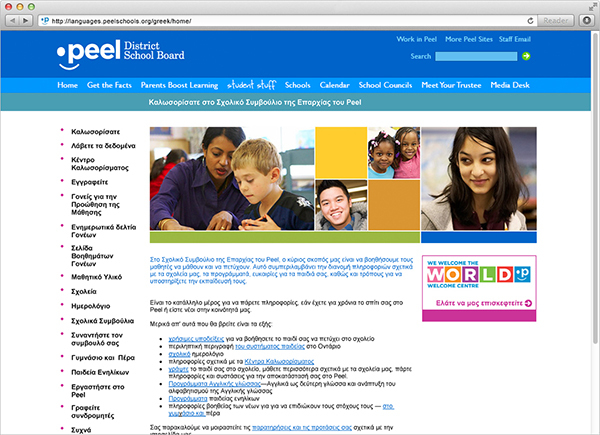 The site was launched online, but also directly to all of the language communities through traditional channels. This required intensive project management, given the number of translators, reviewers, the design team, and developers. The initiative significantly improved the education experience for tens of thousands of children – and their parents. We were recognized for the impact of this initiative with awards from both NSPRA and IABC.